BAD BOY is one of our sponsors and has provided us with a great deal. Our fans can get this great offer by using our BAD BAY Discount Code. When you use one of our promo codes you are directly supporting our podcast and site. Thanks for your support. BAD BOY is a pioneer in the alternative sports lifestyle industry. 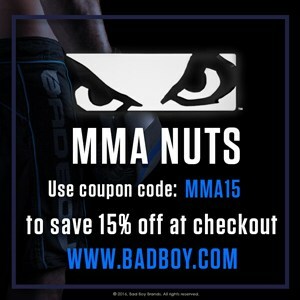 BAD BOY makes top of the line MMA Gear. 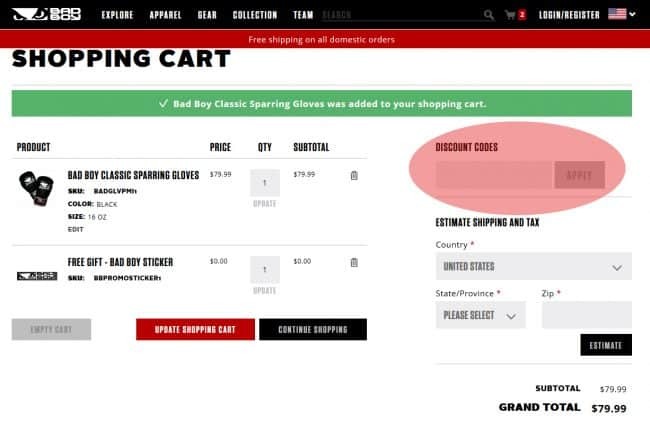 Here’s a list of some of the MMA Gear: Boxing gloves, MMA gloves, Shin Guards, wrist wraps, fight shorts, head gear, focus mitts, and thai pads. BAD BOY is one of our current sponsors and we will be running different contests with them where the winners will be receiving BAD BOY gear for free. BAD BOY sponsors the following MMA Fighters: Alexander Gustafsson, Brandon Vera, Fabio Maldonado, John Lineker, Kelvin Gastelum, Luke Barnatt, Mauricio Rua, Stephen Thompson, Stipe Miocic, Michael Page, and Max Nunes.